Chocobo Mystery Dungeon was my very first Nintendo Wii title (I came late to the party with that console). I bought it second hand, at a ridiculous price (I assume it was a rare release in Australia), but it was worth every cent. The game epitomised the console at its best – it was bright and charming, using warm aesthetics and humble, clean gameplay to compensate for the Wii’s lack of power. 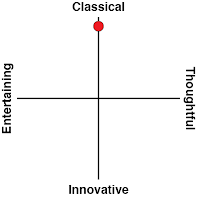 I ended up spending something like 300 hours playing the game, according to the Wii’s clock, which made it second only to Samurai Warriors 3 for my time with the console. I had given up hope of seeing another Chocobo Mystery Dungeon… or another Chocobo title at all. The Nintendo 3DS was meant to have a new Chocobo Racing, but that got canned, and it seemed like the sheer simplicity and happiness of the Final Fantasy sub-series and its adorable yellow mascot was at odds with Square Enix’s general direction. But then Chocobo Mystery Dungeon: Every Buddy! was announced, and while it’s basically a port of the Wii title, just having a Chocobo game on a console I can play again is everything I need. 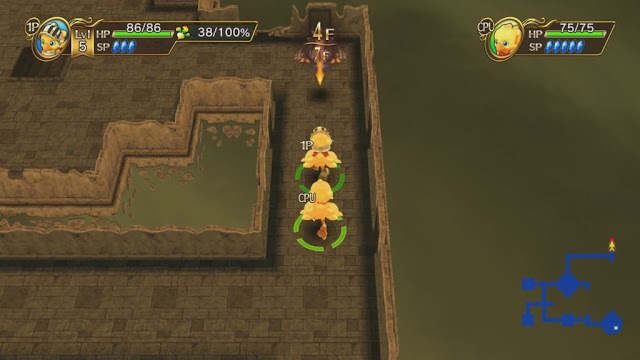 At its core, Chocobo Mystery Dungeon is a very standard roguelike, in the vein of the Shiren the Wanderer series, which established the specific “mystery dungeon” flavour of the genre. Each dungeon is a collection of rooms and corridors, with a staircase to the next level hidden somewhere along the way. Your job, as Chocobo, is to run through, collecting treasures that are randomly strewn around, while battling enemies, using both physical and magical abilities. Get defeated before you get the the bottom floor and beat the boss, and it's back to the first level, minus all the loot you just picked up. Because this is a Final Fantasy title, there are a couple of themed spins on the formula; Chocobo can equip a variety of “jobs”, ranging from Thief to Black Mage, Knight to White Mage, and each of those jobs gives him a different set of abilities to use, with each job leveling up (and unlocking new and more powerful abilities) separate to Chocobo’s experience level. Then there’s the Final Fantasy monsters themselves. The dungeons are filled with familiar, and joyfully rendered, faces, each with their own quirks that have been distilled into the roguelike form. Chocobo Mystery Dungeon is a generally difficult game, but it’s so refined and charming – particularly for Final Fantasy fans, that it’s instantly accessible. 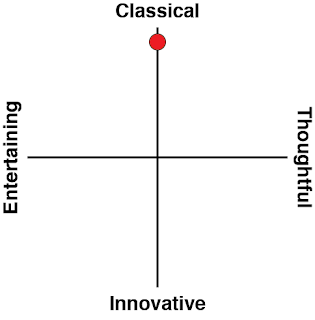 It's also clear case of a character mascot delivery tool. Anyone familiar with Japanese game development knows how hard developers and publishers work to have mascots that are marketable beyond the games they appear in, and the laundry list of these characters is extensive: Mario, Sonic, Pokemon, Jibanyan, Toro the cat, Marie Rose, Monokuma, Nobunyaga, Pac-Man, Link, Hatsune Miku… the list goes on and on. Entire games, such as Super Smash Bros and Warriors All-Stars, are designed around providing fans with Some are attempts at realistic characters, but many of these are modeled after Japan’s love for cute mascots and designs, and Chocobo most assuredly falls into that category. Taking the flightless bird the main final fantasy series, Chocobo, the character, was an attempt to make something that you could see yourself buying as a plushie, T-shirt, or other merchandise featuring the character. As such, there’s all kinds of neat little additions to Chocobo Mystery Dungeon which have little to nothing to do with the game, but rather contribute to the character’s charm. Chocobo can go for a swim around a pool, for example. Or, alternatively, he can drop into a café to have a sip of tea, with the most blissful look over his face. These little moments confer no bonuses to the gameplay, and achieve nothing, but they’re a delight to watch and help build the light, bright character of Chocobo up. It works, too. Following the Wii game I have, in subsequent trips to Japan, bought four of five different Chocobo plushes. In other words, the human condition at its best is always being at the precipice of losing memories, and therefore context to life, because then it holds those memories as something precious. Understanding that those memories – even the painful ones – are important, is something that we need to hang on to. Certainly in Chocobo Mystery Dungeon, those people who have lost their memories are people that can’t be said to have a quality of life – they’re aimless, confused, and soul-less beings, and the snap back into existence once Chocobo restores their memories helps enliven the entire community. Other games have touched on this theme with much greater stakes at play – for all its faults We Happy Few has a genius thought bubble around this topic. Chocobo Mystery Dungeon is the relatively sanitised look at it; the themes bubbling under the surface are certainly dark, but that’s only if you stop to really think on them. It’s equally entirely possible to kick back and enjoy this as Final Fantasy fanservice, in the same vein that World of Final Fantasy is. The fanservice angle is backed up with a stellar soundtrack of remixes of well-loved Final Fantasy music, the chocobo theme (of course), and some original scoring that fits in right alongside it all. 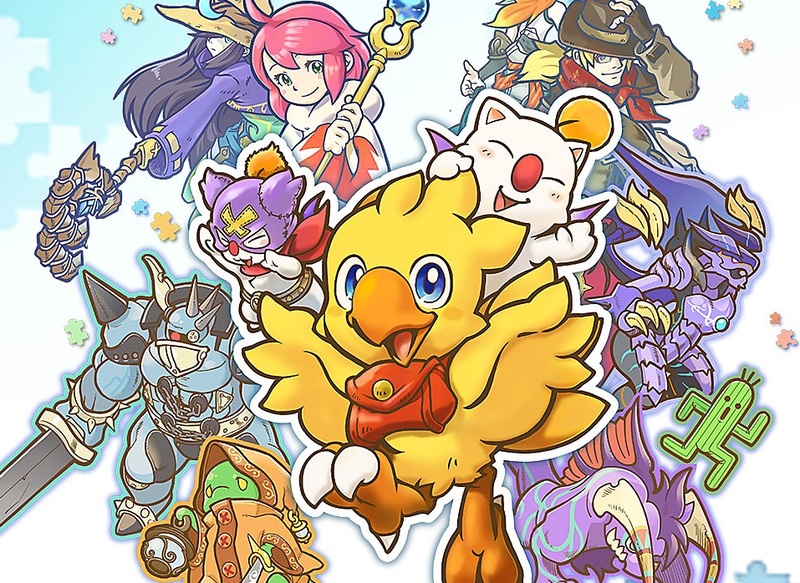 Perhaps even more than the characters, job classes, crystals and classic monsters, what holds Final Fantasy together as a cohesive franchise despite the different worlds and wildly divergent storylines is that music, and Chocobo Mystery Dungeon is certainly part of that tradition. On the other hand, while the music is worth investing in a good pair of headphones for, the voice acting is right up there with the most dismal I’ve ever heard, and I have no idea why Square Enix didn’t do a new record for the voice acting… or at least give us the option of the Japanese original voice performances, where the unfamiliar language could hide any deficiencies in performance. In other areas Square Enix has made changes to Chocobo Mystery Dungeon: Every Buddy, and not for the best. One of my favourite things about the original game on the Wii was the ability to collect cards, and then play a simple, but entertaining card game against other players. It was to Chocobo Mystery Dungeon what Triple Triad was to Final Fantasy VIII, and was, in itself, almost as enjoyable and memorable as the main game. It’s gone now, for reasons I don’t entirely understand. 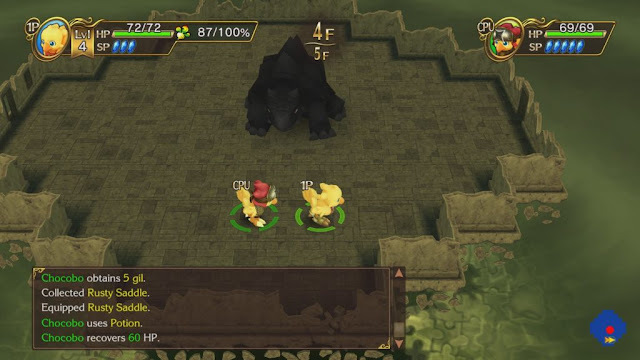 Replacing it is the ability to play in multiplayer, and to collect monsters and have them tag along with you in adventures. This is where the “Every Buddy” subtitle comes in, and the buddy system does add a nice touch to the core game that only helps to build out its charm. Square Enix has also created a range of new jobs for Chocobo, and with that, new cute costumes for him to wear. Sadly, those costumes are locked behind retailer bonuses, across both PlayStation 4 and Nintendo Switch (or, at least, that’s the case here in Japan), meaning that if you want them all, you’re going to need to purchase multiple copies of the game. I hate it when developers do that. DLC would have been fine. Platform and retail-exclusives are just not cool at all. There’s also little doubt that there’s been refinements and improvements to the way Mystery Dungeon and roguelike games work since Chocobo Mystery Dungeon was fresh. Little irritations, like needing to complete a dungeon before being able to remove curses from items (thus being disproportionately difficult if you need to run through it with cursed items) would not be present in a modern mystery dungeon title. 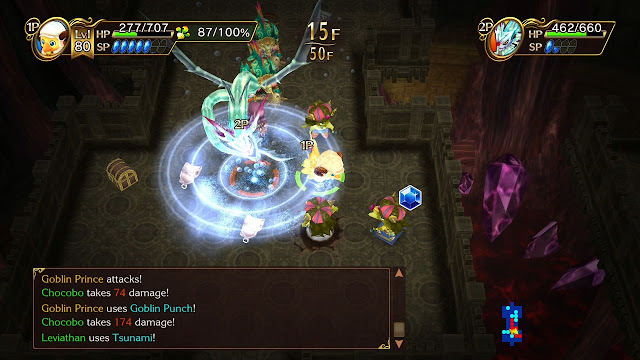 Boss battles also represent some whopping difficulty spikes at times, and while the mystery dungeon formula has always been partial to the grind, those boss battles do take the grind one step too far. Nonetheless as a character-driven bit of Final Fantasy fanservice, Chocobo Mystery Dungeon Every Buddy nails the bright, bubbly charm and joy of a good, humble JRPG. It’s the small moments where you get to simple appreciate Chocobo for the adorable character that he is that it’s at its best, and accompanied by the comfortably familiar and accessible dungeon crawling that it has, this is a relaxing, pleasant, joyful game, and I hope it sells brilliantly, so Square Enix can realise that this is one mascot that shouldn’t be put on ice.